Pavi's Platter: Tomato Pappu / Tomato Dal ! Tomato Pappu (Tomato Dal) is a classic Andhra recipe that is effortless but very delectable and comforting food. If you are on a trip having outside food for a week and when you are back home you will crave for some simple homemade food then this pappu is exactly that kind of dish. Pressure cook the dal and tomatoes with salt and turmeric powder for 3 whistles. Once pressure is released , check the doneness of dal and add chopped coriander. In a kadai / vessel, heat oil, and once hot add mustard seeds, followed by jeera, green chillis, red chillis and hing. Add the tamarind water (must be little , do not add more and make the dal runny). amd let it come to a boil. Now add the cooked dal n tomato mixture and mix well with the tadka. Let it cook on stove top for 4 - 5 minutes until the tadka and tamarind flavor infused with the dal. Turn off stove. This pappu (dal) should be thick and every cooked lentil is visible and not mashed and runny like Sambar made in Tamilnadu style. Adding tamarind is purely optional, the recipe doesnt call for it as the tanginess is already from the tomatoes. But we like it to be extra tangy so we add little tamarind extract. See that you cook the dal perfectly and it not becomes mushy. Add tomatoes generously in case you not adding tamarind extract. 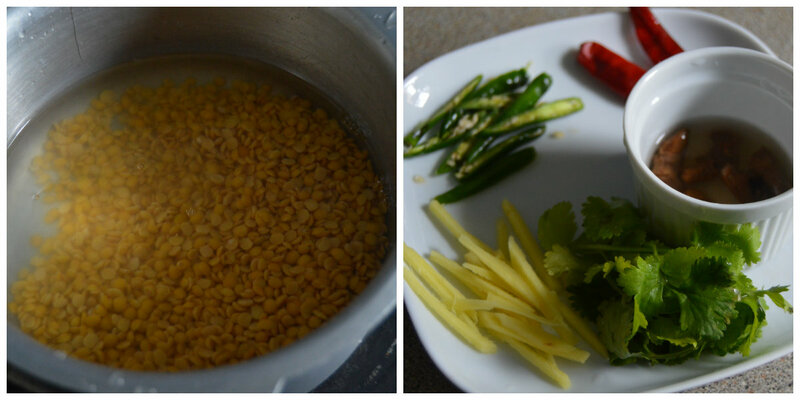 You can also add some slit green chillis while pressure cooking dal if you want the spicyness to be infused in dal. Do not skip the fresh coriander and curry leaves if you have, they accentuate the flavor of the dish.